Just recently British carp anglers Stevie Mitchell and Dave Reynolds returned from a succesfull trip to Les Teillatts. Steve managed to capture two of the biggest common carps in the lake at 79 and 80lb. Les Teillatts is know for it's huge common carp, including 'The Generals Mate'. Still there are many more big commons. Steve Mitchell managed to capture 'The Long Common' at 79lb, followed by 'The Digital Common' at 80lb 8oz. If both fish were captured on the same day, it could have been a new world record brace. 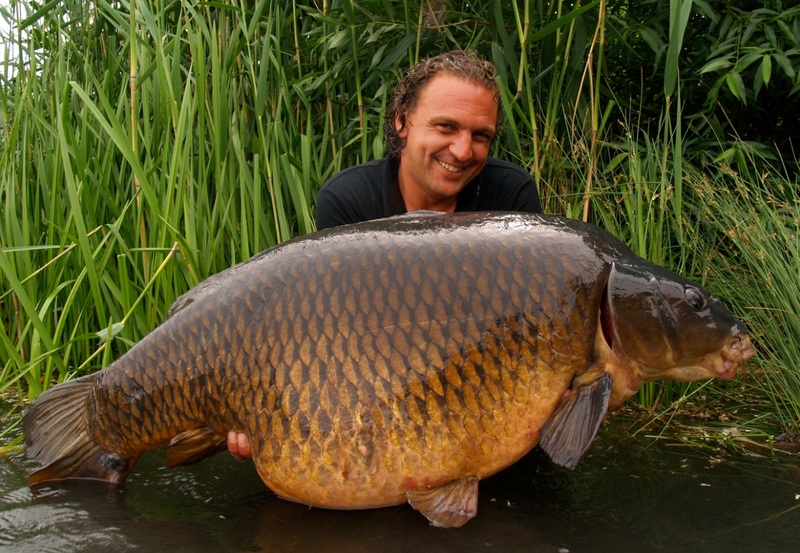 The biggest common carp and current world record right now is Mary, captured at 40,4 kg by German angler Markus Pelzer on a German private lake in the summer of 2011. Since Pelzer was the last one to capture Mary in juni 2011, nobody managed to land the huge common this year. Actually Pelzer was the last angler to capture Mary with his 3 consecutive catches. Another big common carp Eric's Common from the reknown Rainbow Lake near Bordeaux in southern France. This fish already approached the WR weight earlier this year, and was even landed at a new WR weight, but this record was not claimed because it was caught by accident after the fish got tangled up in the lines of a fisherman.